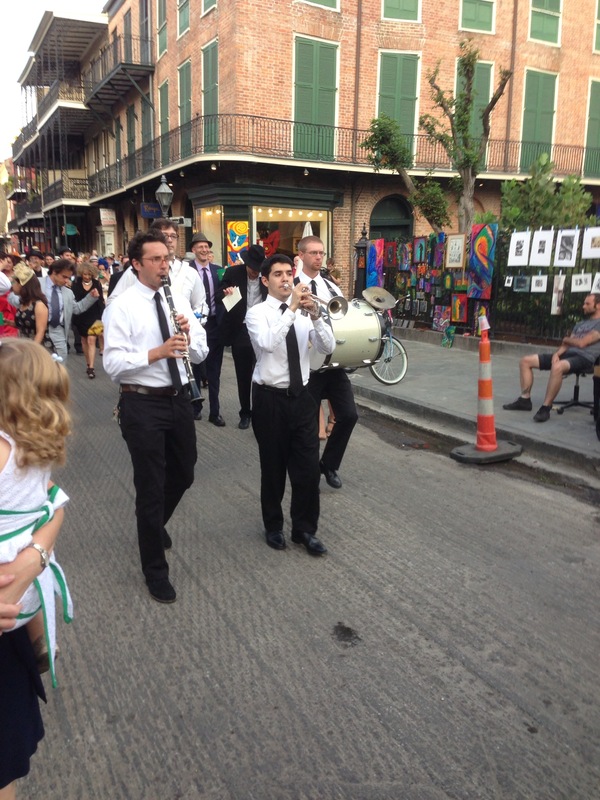 In mid-October I had the privilege of attending one of my best friends from high school’s wedding in New Orleans. If you haven’t been to New Orleans it is definitely a singular experience when traveling through the United States because it feels like you are in a different country. The architecture is old world and quaint while still larger than life in many ways. While famous for Mardi Gras, which often takes place around February or March, New Orleans looks like it is always ready for some kind of parade because there is usually some kind of parade taking place. In October, much of French Quarter was decorated for Halloween (e.g. fake cobwebs and hanging skeletons). A friend commented that these decorations would look cheesy in any other place, but somehow they felt completely appropriate in New Orleans. I couldn’t agree more. Perhaps it is due to the unique Gothic architecture or the plentiful mausoleums present throughout the city. The old and sort of “crumbly” appearance of many of the buildings lends the city some incredible character. Unfortunately, a lot of areas in New Orleans are still recovering from hurricane Katrina (especially the torn up roads and the 9th Ward), but this hasn’t slowed the city down much. As a city born of immigrants and a mixing of cultures, it knows how to keep those cultures alive. This is especially evident in their food. The food is some crazy love child of French, Cajun (yes, French and Cajun are different), Creole, Spanish, German, and traditionally Southern U.S. cuisines. Basically, think of deliciously hearty foods with Caribbean, European, and Southern spices. There are plenty of upscale joints in New Orleans (some pictured below), but the real heart of the food in my opinion comes from the city’s more “divey” eateries. Below are some of my pictures from this trip (mostly food, but some not) as I tried to get as much food in me as possible. I’m sure I missed a lot, but I had fun trying! Click on the thumbnails below to see some of the photos and read my comments about each location. Well… I should probably clarify that I meant divey places with a long-time reputation. My reasoning is that a lot of the more divey places that have been there for years, are usually owned by people that have lived in the area for a long time (sometimes even numerous generations). The influence of that life is in their food because they grew up with it, mastered it, and they are still there today living it for a reason. Often, “divey” places have to make it on the merits of their food as well as tradition rather than flashy dining rooms and high prices. Additionally, these are the places where locals eat (maybe because it’s affordable too), which are usually a good indicator of the quality of food. A quick example is a place like Mother’s Restaurant in New Orleans, which was established in 1938. They’ve been making po boy sandwiches (a New Orleans staple) that whole time. None of this means that fancier or more upscale places aren’t also great places to get a taste of the city, such as Commander’s Palace (established in 1888!) where they make a famous creole turtle soup. That definitely qualifies as authentic. Nonetheless, I felt like I got a lot more “culture” from Mother’s Restaurant where an old, sassy waitress swatted me like a family member would and told me I was blocking the walk way, rather than at Commander’s Palace where a young college student dressed in an ill-fitting uniform politely brought me another martini. Beautiful. New Orleans is on our bucket list of places to visit. And food is a big reason for it! I hope you get the chance to get there! It’s a fun time and a great way to feel like you’re visiting a foreign place without even leaving the U.S.! I need to go and eat like you!! You live and eat the way every man should! !